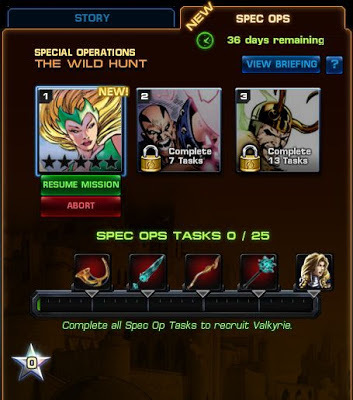 Here's all the tasks you have to complete in Spec Ops 5 ("The Wild Hunt") to add Valkyrie to your roster in Marvel Avengers Alliance. Valkyrie is a Bruiser (tank) hero with KO protection for party. Defeat 3 Escaped Prisoners - Found in Mission 1: The Hunt Begins (normal missions don't count). Defeat a Mini-Boss in Mission 1 - Defeat either Wrecker or Piledriver in Mission 1 to complete this quest. Defeat 3 Jotuns - Can be found in all missions of Spec Op 5 (normal missions don't count). Defeat Enchantress - Boss of Mission 1: The Hunt Begins. 6. Ride of the Valkyrie - Skaal! Collect 10 Unstable Iso-8 - Unstable Isotope-8 can be received in normal combat, as rewards from deploys and boss fights, and can also be gifted by friends. Use Valkyrie's Dragonfang ability 3 times - Dragonfang is Valkyrie's second ability, which restores her health when it defeats enemies. Valkyrie is a Team-Up in the first and third Spec Op 5 Missions. 10. Ride of the Valkyrie - Mission Accomplished! Get 2 Stars of Mastery in Mission 1 - Complete missions to add points to your cumulative score and receive a star at each set benchmark. Upgrade Laufey's Knife to Laufey's Needle - Laufey's Needle can be researched after acquiring Laufey's Knife. Defeat Executioner - Boss of Spec Op 5: Mission 2: A Beast at Bay. Collect 3 Distress Calls - Distress calls can be collected by visiting friends. Remember to use your existing ones to collect more. Take 2 Asgardians into Battle (Can be completed in Story Mode as well) - Thor, Sif, and Valkyrie are all Asgardians. Complete 3 Flight Deck Missions - Send out any Flight Deck Mission with any heroes. Use Valkyrie's Sacrificial Blessing - Sacrificial Blessing is Valkyrie's fourth ability, which reduces her health to place Deathwatch on an ally (and prevents them from being defeated for 1 round). Valkyrie is a Team-Up in the first and third Spec Op 5 Missions. Defeat 5 Illusionary Lokis - Can be found in Mission 3: Götterdämmerung. Collect 20 Unstable Iso-8 - from battles, from friends, or from cash shop. Defeat 4 Wrecking Crew Members - Defeat Wrecker, Piledriver, Bulldozer, and Thunderball in any of the Spec Op 5 missions. Win 1 PvP battle - Enabling PvP requires completing Chapter 1: Mission 4 of Story Mode. Use Valkyrie's Summon Aragorn ability 3 times - Summon Aragorn is Valkyrie's fourth ability, which removes the counter-attack ability from all enemies. Valkyrie is a Team-Up in the first and third Spec Op 5 Missions. Defeat Loki - Loki is the Boss of Mission 3: Götterdämmerung. Complete 3 Stars of Mastery in all Spec Ops 5 Missions - Complete missions to add points to your cumulative score. Get Stars of Mastery once certain point benchmarks are reached. Defeat Destroyer - Destroyer is the Epic Boss in Spec Op 5: Mission 1. To make him appear you'll have to complete every battle and participate in every Deploy as soon as they appear. Reward: 1 Command Point and Valkyrie! If you're looking to save on Isos, I would skip on the deploys they add very minimally to your Mission score. If you don't have the heroes to unlock Destroyer (Epic Boss) for Task 25, you're better off just coughing up the 25 Gold to complete the task and get Valkyrie. Alternatively, if you're just 50 or less Command Points away from getting that last need hero and are down to the wire, just buy the Command Points get the hero. Having trouble with "The scourge" task. I defeated executioner multiple times but the task never completes.... Is this a glitch?